The Calidore String Quartet’s “deep reserves of virtuosity and irrepressible dramatic instinct” (New York Times) and “balance of intellect and expression” (Los Angeles Times) has won them accolades across the globe and firmly established them as one of the finest chamber music ensembles performing today. 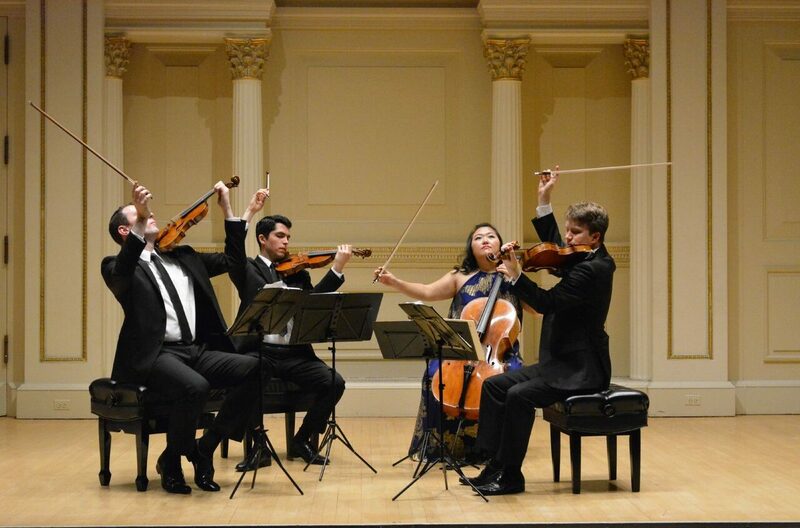 EKSM wraps up the weekend of June 29th & 30th with concerts by this New York-based quartet (violinists Jeffrey Myers and Ryan Meehan, violist Jeremy Berry, and cellist Estelle Choi). As well as being Avery Fisher Career Grant awardees, they made international headlines as the winner of the 2016 M-Prize International Chamber Music Competition, the largest prize for chamber music in the world, and were honoured by both BBC Radio and the Lincoln Centre with awards and multi-year performing and recording contracts. The 2019 Eine Kleine Summer Music Festival will be the Victoria debut for the Calidore String Quartet.